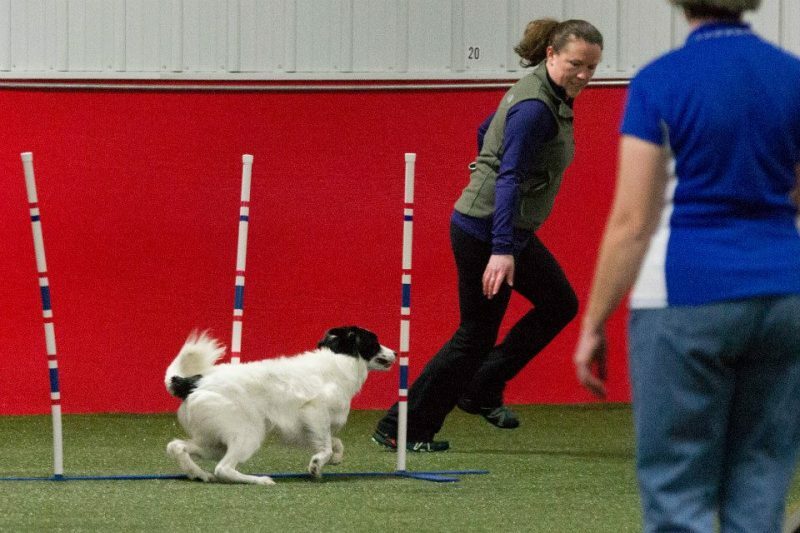 Sport-specific exercise programs designed to help the dog agility handler move more fluidly and efficiently through a course. Improve balance and stability. Learn proper acceleration and deceleration mechanics. Prevent injury. Improve performance. Increase speed and confidence. Become more physically fit. There are several services available ranging from one on one sessions to instruction for DISTANCE clients. Improve your level of fitness and agility performance from ANYWHERE IN THE WORLD. As a Certified Athletic Trainer with over 19 years of professional experience and state (WA) Licensure, Kristin is experienced at guiding clients to achieve their fitness and athletic potential. Understanding Change of Direction – learn the core principles behind change of direction, including how to efficiently work with gravity to move with less effort. Transfer Motion in a New Direction – learn efficient movement strategies for crosses requiring a change in direction of motion. Understand how to safely apply your brakes going into a turn, transition your motion into the new direction and accelerate out of the turn. Execution of Handling Cues Without Pain – Save your spine and knees while executing handling cues. Kristin will show you efficient body mechanics for preserving your joints and how to utilize your available joint range of motion to accomplish the task safely! Timing and Speed Control – Learn how to pace your motion relative to your dog so you can avoid leaving your dog behind or being left in the dust yourself. Integration and Transfer of Learned Body Mechanics – Combine previously learned body mechanics for efficient and effective braking, transitions (change of direction) acceleration, speed control and injury prevention. Combine chains of efficient motion into complex strings of handling cues. Team Connection – Explore the depth of the interspecies relationship, teamwork and energetic connection that brings value to your human-canine partnership. Learn why and how these energies can bring about beautiful, synchronized experiences moving through a course as one unit seemingly defying the laws of time and space. Submit video of three agility runs for the human’s physical performance to be analyzed for movement efficiency. A limited dialogue following the analysis will address understanding and recommendations. All communications occur by email. Please send your YouTube video(s) to IntegratedPrevention@msn.com along with any specific questions you want addressed. One on one instruction focused on helping you move more efficiently and fluidly through an agility course. Sessions may include sport specific workouts, movement analysis and education, therapeutic exercise recommendations, post-rehabilitative reconditioning, sports medicine comprehensive return to play recommendations, performance assessments or agility handler specific problem solving. These sessions take place at a mutually agreed upon location. Travel and facility rental fees may apply. Please inquire. Need help with some specific fitness goals? Looking for a tailored exercise program with follow up feed back and ongoing support? Distance clients may obtain instruction in a variety of ways including phone, Skype, email or online meetings (with video feed). Customized packages may include web meetings, online forums, documents outlining workouts and individual conditioning plans designed around training and competition. Please inquire for a package quote.